Anna was born in Thayer, Missouri in 1916 to Emil and Ida Beyer Maag. The family moved to Joplin, Missouri to farm and to Ponca City in 1921. During high school, Anna worked as a “live-in” nanny for the Schwemine family and at Beatty’s ice cream shop. She graduated from Ponca City High School and Ponca City Business College and began work at the Ponca City Telephone Exchange, where her job required wearing roller skates to navigate the wooden floor. In 1938 she and Keith Wittmer eloped, and after finally revealing their marriage, they established a home in Ponca City. In 1939 they moved to California to be with siblings waiting to ship out. While in California, Anna worked for the Red Cross. She moved back to Ponca city and resumed her job at the telephone office while Keith served overseas. In 1948, she was working at Conoco, but she eloped again to marry Robert Weeks in Pawhuska where he was running a harvest crew. They became a “blended” family and made their home in an upstairs apartment over the cafe that Bob also managed and where he functioned as head cook. They later owned and operated Bob’s Cafe’ in the building now occupied by the museum. While her children were in elementary school, she served in the PTA and was a Blue Bird and Camp Fire Leader. Because she had never learned to drive, she practiced backing out of the driveway until she got up the nerve to drive around the block, and when she passed the driving test, Anna brushed up on her shorthand and went back to work at Conoco. She retired in 1978. After retirement and Bob’s death, she traveled with her friends and attended French classes at NOC so that she could communicate with her Swiss cousins. She was a member of the First Baptist Church in Tonkawa and served as secretary for the Women’s Missionary Union for twenty years. 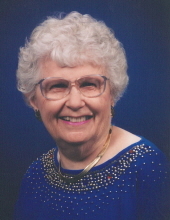 She belonged to the Glenrose Club, the Madonna Lily unit of the Tonkawa Garden Club, and enjoyed quilting with the Overtones at the Baptist Church. Until her eyesight waned, she also enjoyed crocheting, knitting, crossword puzzles and putting together jigsaw puzzles. Anna enjoyed Genology and made a family book with her brother. She was an avid reader, and the Tonkawa library always had books on hold for her. In April 2018, Anna moved into Willow Haven Nursing Home where she passed peacefully on April 11, 2019.